Flour. Eggs. Butter. Vanilla. IPA. Make sure your holiday baking list includes the standards for all your delicious desserts plus some of your favorite beverages from Bernick’s! That’s right – beverages. Last year I shared a blog featuring holiday cocktail recipes featuring our favorite products, and this year I am combining our products with baked goods … the best of both worlds! Enjoy the collaborations! Just like the classic recipe – flaky crust and a smooth, lemony filling with the right touch of beer flavor. Preheat oven to 350°. In a food processor add flour, powdered sugar, butter, and salt until well combined. Press into the bottom of a buttered 8x8 pan. Chill for 15 minutes. Bake crust for 20-25 minutes, or until golden brown. Remove from oven and allow to cool to room temperature. In a large bowl, whisk together the eggs, sugar, flour, and cornstarch. Add in lemon juice and beer and stir until combined. Pour filling over cooled crust, bake until center is set, 25 minutes or so. Allow to cool slightly before refrigerating. Chill for 3 hours before cutting; dust with powdered sugar prior to serving. A rich, chocolately cake made moist and delicious with Dr Pepper’s distinct flavor. Preheat oven to 325°. Butter and dust with flour a 10” Bundt pan. In a small saucepan, heat the Dr Pepper, cocoa powder, and butter over medium heat until the butter is melted. Add sugars and whisk until dissolved. Remove from heat and let cool. In a large bowl, whisk flour, baking soda, and salt together. In a separate bowl, whisk the eggs until just beaten, then add to the cooled cocoa mixture, gently folding the mixture until slightly lumpy. Pour batter into prepared pan and bake for 35-40 minutes, rotating the pan halfway through baking time. Transfer the pan to a wire rack to cool completely. Gently loosen the sides of the cake from the pan and turn it over onto a rack. Place all ingredients in a food processor, pulse in short bursts until the icing is shiny and smooth. Use a spatula to spread icing over the Bundt cake, and serve once icing is set. Perfect for beer lovers, this take on Tiramisu features a dark, thick stout in place of espresso. In a bowl, combine the mascarpone and sugar and stir to dissolve. In a stand mixer, whip the whipping cream until stiff peaks form, 2-3 minutes. Fold the whipping cream into the mascarpone. Pour the beer into a shallow bowl. Dip the ladyfingers in the stout, turning over once. Don’t soak them; they’ll fall apart. Place the ladyfingers in a tight, single layer breaking to fit on the bottom of four small, individual ramekins or bowls. Spoon on a bit of mascarpone. Dust with dark cocoa powder. Repeat layers, finishing with cocoa dust. Warm, spicy, and sweet, ginger ale gives this decadent version of the brownie a new kick. Preheat oven to 350°. Butter a 9x13 pan or line with parchment paper. In a large bowl, combine the flour, sugar, and salt. Add the butter, eggs, ginger ale, and grated ginger. Beat with a handheld mixer until well blended. Pour the batter into the pan, and bake for 30 minutes, or until lightly golden and firm. Remove the Blondies from the oven, and pierce the cake with a fork. Pour the glaze over the top, spreading evenly. Let Blondies set up before garnishing with ginger snap cookies, if desired. The comfort of a seasonal cupcake paired with hard cider’s depth of flavor, plus cream cheese icing! Preheat oven to 350°. In a large bowl, beat together butter and sugar until fluffy. Add the eggs one at a time to ensure they’re well incorporated. Add the flour, baking powder, cinnamon, salt, and nutmeg. 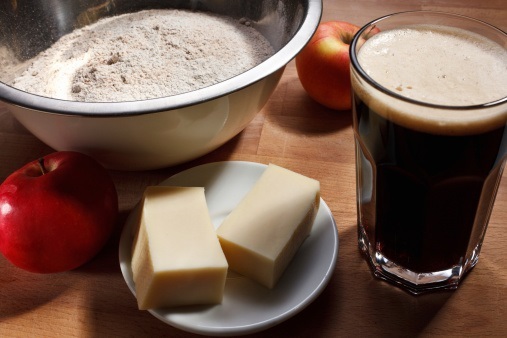 Add vanilla, milk, and slowly pour in hard cider while the mixer is blending. Place shredded apples on a paper towel, and ring out excess moisture. Add shreds to batter mixture. Line two cupcake pans with liners, and fill each ¾ full of batter. Bake for 15 – 18 minutes. Cool completely before icing. For the icing, cream the cream cheese and butter until mixed. Add powdered sugar a cup at a time making sure each cup gets fully incorporated. Add cinnamon, vanilla, and salt and mix. Smooth over cooled cupcakes, and drizzle with maple syrup and pecans if desired. Let us know if you try any of these delicious holiday recipes, and which are your favorites! We’ve got a whole bunch of fun holiday recipes on our Pinterest page – be sure to check it out! Happy Holidays from all of us at Bernick’s – cheers!